Guru Nanak the founder of Sikhism spent a major part of his life preaching his concept. He traveled deep west up to Iraq (perhaps Turkey also), East up to Assam/Meghalya/Tripura, North up to Tibet and we have clear evidences of his going to Sri lanka in South. But Kartarpur is the town (32.087129, 75.016612 see www.maps.google.com) he founded with the assistance of Karoria the revenue collector Duni Chand of Kalanaur where our beloved Guru stayed for about 18 years and finally breathed his last. But it is definitely certain that I come from the blessed land where Guru sahib spent so many years. My village where I was born (year 1951) and brought up is Alawalpur near Pakiwan / Sarje Chakk, Mir Kachana, Roora, Shahpur Goraya about 9 km east of Kartarpur in India. Since Kartarpur sahib dome is appreciably high, it is visible from my house top. It was at least clearly visible till the eucalyptus trees were planted along dhussi the raised embankment along the border. I donâ€™t remember when I first had its darshan but I do vividly remember the clear sky sometimes in the year 1964 when ashes of Baba Boorh Singh (my grand fatherâ€™s brother) were to be immersed in river Ravi. I accompanied my uncle Major (havaldar) Malla Singh and Hazara Singh. We traveled about 5 kms journey (obviously) on bare feet! In those days elephant grass was not so common in the bela the kind of forest land on border as it is these days. 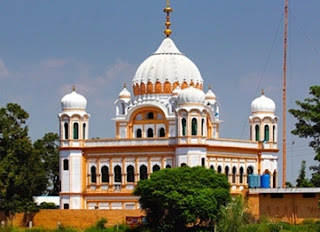 My uncles didnâ€™t mind even the Pakistan territory and we went so close to Kartarpur sahib that that the moment we reached the river, Kartarpur sahib there was a magnificent building floating on the water. It was such a scintillating scene ( I would say miraculous ) that I will remember till the last day of my life. Viewing it chacha Hazara Singh got emotional. He cursed the British that we had been departed from our founderâ€™s shrine. In those good old days the villagerâ€™s source of entertainment were few and the the festivals were a major source. At Kartarpur they say the Massia the day of the moonless night festival used to a big attraction. Uncle Kartar Singhâ€™s bullocks won many a laurels at Kartarpur the Well of our Master. Baba Sampooran Singh became famous throughout the region because he could lift the well (I.e entire infrastructure of well). Later Nihang Pooran Singh of Kakkeke had interesting tales when he could still go to the shrine in the night sky to pay his obeisance while on his cattle stealing spree from the Pakistan territory. There used to be praises for the Manji Torh wala jatha (?) because that singer did keertan at such a high pitch that it could be heard at village Kakkeke. There would be talk of a Muslim follower of Kartarpur who would donate Karah Parsad of Rs. 100 every year. My mother who is 93 years is deeply devoted to Kartarpur sahib and says my elder brother was born with the blessings of Kartarpur sahib. She remembers the days when a railway line was laid to Kartarpur from Amritsar especially the construction of bridge on river. What I feel today is that Kartarpur sahib was not only the religious epicentre of the people around it and was perhaps social and cultural centre too. I left the village for my higher studies and obviously I lost track of Kartarpur until 1980, when my younger sister was married to Daljit Singh of Dera Baba Nanak and his farms were more close to Kartarpur border. In the end of 1988, I was transferred to Punjab and obviously visited Dera Baba Nanak on and off. I would then curse the Sikh leaders for the abandonment of such an important shrine as Kartarpur. We discussed among the friends of the alternatives for Kartarpur. Some one suggested that the countries do exchange territories. For me this was the solution because I knew there were many chinks of land of Indian territory that were beyond Ravi and thus inconvenient. I would read of a corridor in Bangladesh territory. Perhaps it was called Teen Bigha. My office junior Manjit Singh an amritdahri Sikh once remarked (in 1992) â€œSir, it appears you are going to create some problem for the Sikhs.â€ His was the first remark that I later discovered almost every Sikh leader felt that very way. I really feel sorry for that kind of mind set. I had the proud privilege to accompany a Jatha (troupe) of about 3000 Sikhs to Sikh shrines in Pakistan that left India by train on April 11,1994. Sardar Manjit Singh Calcutta, Secretary SGPC was the Jatha leader. The Jatha reached straightaway at Hasan Abdal (Panja Sahib) at 4 a.m the next morning. We learnt that a minister from Pakistan Federal Govt was arriving at 8 am to welcome the Sikhs. Devotees were hardly ready because there were a few bathrooms. Though I myself got ready at 8. Accordingly Sardar Fateh Mohd. Hassani, Federal Minister of Minority Affairs, Pakistan Govt ( Benazir Butto Govt) arrived well in time to welcome us. He started addressing sangat the congregation at about 8-30. The sangat was at that time busy doing their matha tek while the Gurdwara Panja Sahib hall was very small. Since the sangat was still arriving the whole scene became utterly chaotic and embarrassing for the Sikhs. The truth is no body was listening to the Minister. No body was taking any initiative to save the situation. The Minister was despite continuing his address. I got up and approached Calcutta sahib to ask the Sangat to sit down and listen our Muslim Guest the minister. Mr. Calcutta was a bit rude to me, â€œwhat the hell can I do?â€ I repeated my request that he ask the sangat to sit down. He said he had got no sewadar around who can help it. Rudely again he asked me if I was feeling so bad I could do it myself. I lost no second and took the command and requested everybody to get down. It took hardly 2 -3 minutes and now everybody was respectfully sitting where ever they were standing. People stopped matha tek. It was all calm and quite. Sardar Hassani was a young minister from Balochistan and his Urdu was not easily understandable to every one. In his speech he emphasized that the Pakistan Govt was sincerely for good relations with Sikhs. After his speech, was the ardas and then the Gurdwara had arranged a tea party (langar) for Janab Hassani. Leaders of the Sikh Jatha left the Gurdwara along with Pakistani officials. But before the minister was out of the hall he looked at me (sitting) left behind. His PA returned to me and asked me to accompany the minister. When I was in his company, the PA remarked to me, â€œSardar sahib! have you felt how the Sikhs were behaving in a stupid manner. Obviously I felt very much offended. The minister heard his curt remark but did not react. The PA started correcting himself, â€œI meanâ€¦me.. look the Pakistan Govt is taking lot of steps to keep the Jathas comfortable but the â€˜innocentâ€™ Sikhs were not appreciating it and rather our minister was insulted. I explained him that the Sikhs were not at fault. If at fault was some one it was the management. I then spoke of the crowd behaviour what I had learnt in my MA sociology course. I told the PA how the crowd is like a ploughed field in which the farmer leader can sow any seed and it germinates. I told him, look the people were standing but when I requested them they dutifully obeyed me. So the fault was not with the crowd. The PA unfortunately passed another remark, â€œBut we understand the Sikhs are an innocent lot who is always exploited by the clever Hindus.â€ It was a second embarrassment for us all. I said, â€œLook PA sahib! We exactly think the same of Muslims.â€ I never knew that the Minister was very carefully listening to our dialogue while Mr. Calcutta was busy with the Director and Sindhi Sikh leaders. The minister then jumped in our discussion and very politely asked me to tell how the Sikhs think that the Muslims are a â€˜stupidâ€™ lot. He assured me he would not mind my reply what ever blunt it was. Then I started explaining. I said that is why we Sikhs think that the Muslims are innocent. The minister then hurriedly said, â€œleave that question and tell where that grave is.â€ I said it was very much in Pakistan AND THAT PAKISTAN HAS NEVER BOTHERED TO SHOW IT TO THE VISITING SIKHS FOR THE LAST 47 YEARS. The Director of Evacuee Property Trust Board (EPTB) was busy with Calcutta sahib and minister sought his attention and asked where that grave of Guru Nanak exists. The director had no knowledge of it. I then explained the minister the whole thing about Kartarpur sahib. They made formal official notes of the â€˜graveâ€™. I came back and forgot every thing about the Panja sahib episode. In 1997 however some one told me that in Ajit daily there was Dera Baba Nanak datelined news that Pakistan could grant some kind of corridor to Kartarpur. But till this date I have failed to see the news my self. A year ago I spoke to Sohan Singh Khasanwali the then correspondent of Ajit but he could not remember the source of such a news. In 1998 however there was a detailed article on Kartarpur sahib by Elias Ghuman of Lahore. I regret I could not preserve that article. In the year 2000 then appeared again a detailed article by Mr. Bhullar of Bhai Mardana Yaadgari Keertan Durbar Society Ferozepur with a coloured photo of Darbar sahib building. It also said that Pakistan might consider granting free corridor to Kartarpur sahib. I extensively used that photo in the later publications. In the same year Mr. Varinder Walia of Tribune accompanied the Jatha and published the news of Pakistani intention.